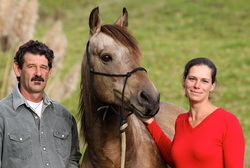 We welcome you to the North River Horse & Humanship Centre offering you a unique environment for your learning experience amid the natural rural landscape of Northland, New Zealand. The North River Horse & Humanship Centre is where people and horses come together to learn and teach in extraordinary ways. Here our horses and us can offer you a variety of learning experiences suited to everyone. Do you want to have access to a horse on a regular basis but just don't have the time, the facilities or the skills necessary for having your own horse? In January we are offering again our Pony Play Days for children. Do you want to learn more about horses or your pony and have 4 days full of fun, playing and learning with horses and riding?